The US State Department on Friday said that Washington is “deeply concerned” at the release of 26/11 Mumbai attack mastermind and JuD chief Hafiz Saeed, according to Reuters. The US State Department on Friday said that Washington is “deeply concerned” at the release of 26/11 Mumbai attack mastermind and JuD chief Hafiz Saeed. Hafiz Saeed, who had been under house arrest since January this year for his role in terror activities, was on Friday set free after the Pakistan government decided against detaining him further in any case. "The United States is deeply concerned that Lashkar-e-Taiba (LeT) leader Hafiz Saeed has been released from house arrest in Pakistan. LeT is a designated Foreign Terrorist Organisation responsible for the death of hundreds of innocent civilians in terrorist attacks, including a number of American citizens," state department spokesperson Heather Nauert said. 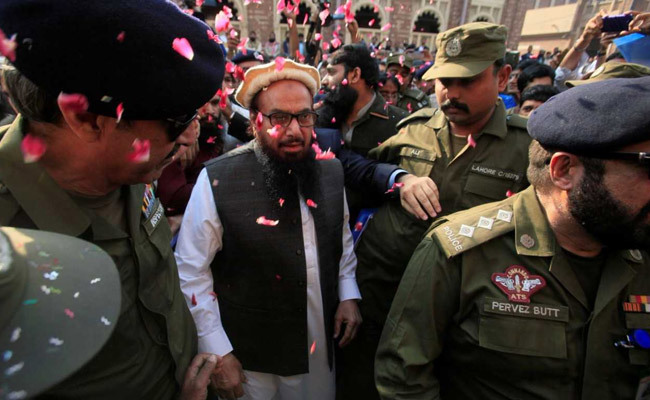 Reacting to Washington's move, the JuD said that Hafiz Saeed has no connections with the 26/11 Mumbai attacks, adding that he is a "peace loving" person against whom India has put "false allegations". The Pakistan-based terror organisation added that the United States tried to put pressure on Pakistan to hold the release of Hafiz Saeed, but failed to do so. Soon after his release, the JuD chief said that he will gather people across Pakistan for the "cause of Kashmir" and help the Kashmiris secure "freedom". "I fight the case of Kashmiris. I will gather the people from across the country for the cause of Kashmir. And we will try to help Kashmiris get their destination of freedom." "I am very happy that none of the allegations against me proved as three judges of the Lahore High Court ordered my release ...India had levelled baseless allegations against me. The Lahore High Court's review board decision has proved that I am innocent," Saeed said. The JuD chief said that the US, on India's request, pressured Pakistan to detain him. "... I was detained on the pressure of the US on the Pakistani government. The US did so on the request of India," he claimed. The JuD leader, who has a USD 10 million American bounty on his head for terror activities, walked free after his 10-month detention as the Pakistan government decided against detaining him further in any other case, in a setback to India's efforts to bring to justice the perpetrators of the Mumbai terror attack.